The gallbladder, in pathology (and general surgery), is a growth industry... due to the worsening obesity epidemic. 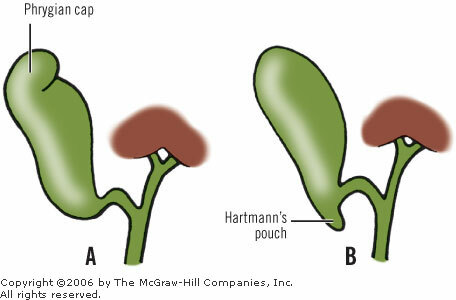 Hartmann's pouch - invagination of the gallbladder wall at the origin of the cystic duct. Small amount of lymphocytes in the lamina propria. As there is no muscularis mucosae, the cancer staging is different; pT1a is lamina propria invasion. pT1b is muscle layer invasion. AKA adenomyomatosis of the gallbladder. Analogous to what happens in the uterus. Significance - may mimic malignant tumours of the gallbladder. Cystic spaces (Rokitansky-Aschoff sinuses) - may be seen on imaging. Glands in muscularis propria of the gallbladder wall - key feature. Significant muscular hypertrophy - key feature. Chronic cholecystitis - has less muscular hypertrophy; overlaps with this diagnosis. Adenomyomatosis of the gallbladder (radiographics.rsna.org). - CHRONIC CHOLECYSTITIS WITH MILD CHOLESTEROLOSIS AND ADENOMYOSIS (FUNDUS). Polyps are significant as they may be adenomatous, i.e. pre-cancerous. These are similar to polyps found elsewhere GI tract. +/-Intestinal metaplasia --> goblet cells. Thought to arise in the context of an outflow obstruction. Mucosal pouch penetrating the muscularis propria of the gallbladder wall - key feature. - CHRONIC CHOLECYSTITIS WITH DIVERTICULOSIS. Pancreatic heterotopia near cystic duct in 35 year old women. A. The cystic duct margin is at right; the heterotopia, at left. This cannot be a portion of the pancreas because the cystic duct margin lies proximal to the common bile duct. B. Pancreatic ducts with lobular proliferation, but without the inflammation that would usually be present were this obstruction by a gallstone. C. Nuclei of the duct and the proliferated bile ductules are bland. D. Acini are unremarkable; no pancreatic islets were seen in this case. Antral type metaplasia --> intestinal metaplasia --> dysplasia --> carcinoma. AKA pyloric metaplasia, pseudopyloric metaplasia, mucous gland metaplasia. Cells often in nests -- below luminal surface. Cells vaguely resemble foveollar epithelium of the stomach. May look similar to cells of the gallbladder neck and common bile duct. These glandular cells are not as columnar and have less well-defined cell borders. Cells with antral type metaplasia >2:1 (height:width), benign mucosal glands <2:1. - Chronic cholecystitis with antral-type metaplasia, NEGATIVE for dysplasia. Gallbladder dysplasia is covered in gallbladder adenoma. Lesion defined as being >1cm. Oten arise in a background of pyloric-gland metaplasia. May be associated with invasive adenocarcinoma, which should be reported as intracystic papillary neoplasm with an associated invasive carcinoma and staged. No particular association with gallstones. Intestinal types with goblet, Paneth, and/or serotonin-containing cells. Notes: All of the gallbladder should be submitted prior to sign out to exclude invasive adenocarcinoma. ↑ URL: http://web.uni-plovdiv.bg/stu1104541018/docs/res/skandalakis'%20surgical%20anatomy%20-%202004/Chapter%2020_%20Extrahepatic%20Biliary%20Tract%20and%20Gallbladder.htm. Accessed on: 13 December 2012. ↑ Saul, WM. ; Herrmann, PK. (1988). "[Adenomyoma of the gallbladder].". Dtsch Z Verdau Stoffwechselkr 48 (2): 112-6. PMID 3168899. ↑ Sasatomi, E.; Miyazaki, K.; Mori, M.; Satoh, T.; Nakano, S.; Tokunaga, O. (Oct 1997). "Polypoid adenomyoma of the gallbladder.". J Gastroenterol 32 (5): 704-7. PMID 9350002. ↑ Ching, BH. ; Yeh, BM. ; Westphalen, AC. ; Joe, BN. ; Qayyum, A.; Coakley, FV. (Jul 2007). "CT differentiation of adenomyomatosis and gallbladder cancer.". AJR Am J Roentgenol 189 (1): 62-6. doi:10.2214/AJR.06.0866. PMID 17579153. ↑ 5.0 5.1 Boscak, AR. ; Al-Hawary, M.; Ramsburgh, SR.. "Best cases from the AFIP: Adenomyomatosis of the gallbladder.". Radiographics 26 (3): 941-6. doi:10.1148/rg.263055180. PMID 16702464. ↑ 6.0 6.1 Iacobuzio-Donahue, Christine A.; Montgomery, Elizabeth A. (2005). Gastrointestinal and Liver Pathology: A Volume in the Foundations in Diagnostic Pathology Series (1st ed.). Churchill Livingstone. pp. 439. ISBN 978-0443066573. ↑ URL: http://radiopaedia.org/articles/phrygian_cap. Accessed on: 16 May 2014. ↑ Tadrous, Paul.J. 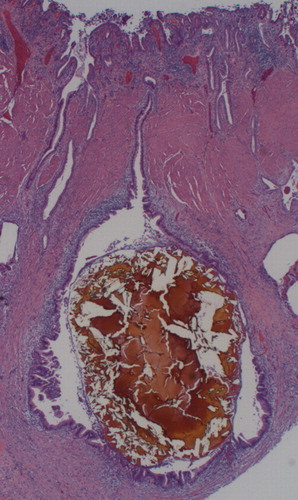 Diagnostic Criteria Handbook in Histopathology: A Surgical Pathology Vade Mecum (1st ed.). Wiley. pp. 172. ISBN 978-0470519035. ↑ Beilby, JO. (Aug 1967). "Diverticulosis of the gall bladder. The fundal adenoma.". Br J Exp Pathol 48 (4): 455-61. PMC 2093791. PMID 4963758. //www.ncbi.nlm.nih.gov/pmc/articles/PMC2093791/. ↑ Duarte I, Llanos O, Domke H, Harz C, Valdivieso V (September 1993). "Metaplasia and precursor lesions of gallbladder carcinoma. Frequency, distribution, and probability of detection in routine histologic samples". Cancer 72 (6): 1878–84. PMID 8364865. ↑ 11.0 11.1 Mukhopadhyay S, Landas SK (March 2005). "Putative precursors of gallbladder dysplasia: a review of 400 routinely resected specimens". Arch. Pathol. Lab. Med. 129 (3): 386–90. PMID 15737036. http://www.archivesofpathology.org/doi/pdf/10.1043/1543-2165%282005%29129%3C386%3APPOGDA%3E2.0.CO%3B2. ↑ 12.0 12.1 12.2 Mills, Stacey E; Carter, Darryl; Greenson, Joel K; Oberman, Harold A; Reuter, Victor E (2004). Sternberg's Diagnostic Surgical Pathology (4th ed.). Lippincott Williams & Wilkins. pp. 1789. ISBN 978-0781740517. ↑ Cutz, E. 3 March 2011. ↑ Adsay, V.; Jang, KT. ; Roa, JC. ; Dursun, N.; Ohike, N.; Bagci, P.; Basturk, O.; Bandyopadhyay, S. et al. (Sep 2012). "Intracholecystic papillary-tubular neoplasms (ICPN) of the gallbladder (neoplastic polyps, adenomas, and papillary neoplasms that are ≥1.0 cm): clinicopathologic and immunohistochemical analysis of 123 cases.". Am J Surg Pathol 36 (9): 1279-301. doi:10.1097/PAS.0b013e318262787c. PMID 22895264. This page was last modified on 30 October 2017, at 10:06.